This site commemorates the first major European exploration of the American Southwest, the 1540-1542 expedition led by Francisco Vásquez de Coronado. The expedition was searching for the seven mythical gold Cities of Cíbola rumored to be somewhere north of Mexico. 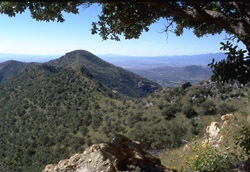 Although the Spanish government ultimately considered the expedition a failure, historically it is viewed as a success because it opened territories to the north of Mexico and led Spain to colonize the American Southwest. The nearly 5,000-acre Memorial lies on the U.S.-Mexican border within sight of San Pedro Valley where historians believe Coronado entered the present United States. The scenic overlook at Montezuma Pass offers spectacular views of the surrounding countryside. Administered by the National Park Service, Coronado National Memorial is 21 miles south of Sierra Vista, Arizona, five miles off Arizona 92. The overlook is accessed by both road and hiking trail. From there a short interpretive trail leads to Coronado Peak. The Memorial is open daily from 8:00am to 5:00pm, except Thanksgiving and Christmas Day, free of charge. Please call 520-366-5515, or visit the Coronado National Memorial website for further information.